Thanks to its technical capability, experience and presence, Maccaferri can deliver local solutions to problems created by global issues. The increasing complexity of climatic and environmental challenges require effective solutions in order to secure industrial facilities, infrastructure and agriculture. Demographic trends in world population will continue to rise further impacting scarce resources that are already costly and unevenly distributed across the planet. Administering policies to address such challenges will be a governments’ duty. Nonetheless, the strong commitment from the private sector needs to be emphasised: civil engineering companies like Maccaferri are pushing further their commitment into research and development in order to find solutions that meet environmental, technical and commercial criteria. The recent celebrations of Maccaferri’s Innovation Center testify such a strategic approach. Infrastructure needs to be, at the same time, cost-effective and environment-friendly. It must be scalable and flexible in order to complement local realities. It must be efficient to install, long lasting and good value to accommodate the increasing financial constraints in public finances. Put simply, we need to do more with less. Balancing such requirements is not straightforward for civil engineers, yet Maccaferri can proudly claim to have a strong record of achievement. Our strategy of vertical integration (we research, manufacture, design, supply and construct) means that our solutions are tailored for the specific task in hand, reducing waste, carbon footprint and costs of implementation. 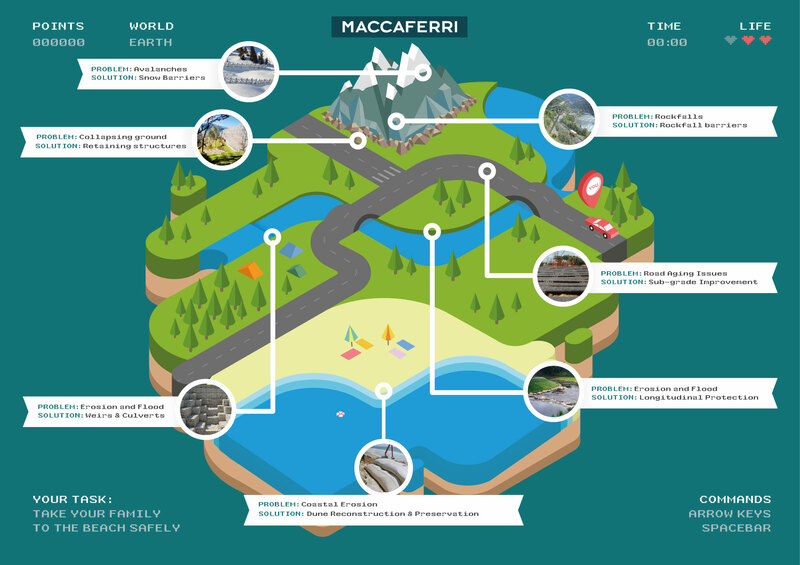 Maccaferri is able to intervene globally in multiple natural scenarios both preventing and facing natural hazards as they occur. Our solutions include those that reduce erosion, reinforce soils, retain the ground and mitigate natural hazards; we make the earth perform better than it does in its natural state. Prevention is the key: collapsing grounds can be stabilized with retaining structures, erosion-affected shorelines can be preserved by extensive dunes reconstruction, rockfalls and landslides can be contained. These interventions reduce precious land-loss and keep our infrastructure safe. Systems that improve the service life of our roads maintain efficient links between populations and extend the time between maintenance disruptions. Water loss and flood damage can be reduced through Rivers management and channelisation. Saving and managing fresh water is a precondition to rerouting the “blue gold” where it is most needed. Geosynthetics and geocomposites, alongside our classic solutions like our Gabions retaining walls are ubiquitous, yet often invisible, in the modern environment. Forecasts estimate that both geosynthetic and geotextile markets will rapidly increase in the upcoming years reaching more than $27 billion by 2022 and nearly $9 billion by 2019, respectively. Maccaferri will continue in its efforts to improve the performance and sustainability of civil engineering through its worldwide presence, technical capability and sharing knowledge with the global civil engineering community.